Your new cover is designed to sit directly into the plenum between each fuel injector. In order to install this part place the unit in position over the engine and check the fit of the downward tabs to make sure they are in the correct position. 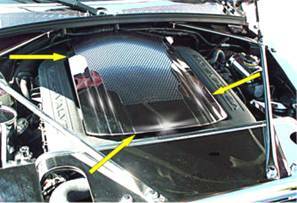 Although the plenum cover comes to you pre shaped it may be necessary to adjust the tabs so that they easily slide between each fuel injector with out binding. CARE AND MAINTENANCE: Care must be taken when cleaning your cover. It is a good idea to lightly dust your cover with a clean soft cloth first in order to prevent any particles from scratching it. Then wipe (using a new clean soft cloth) with a good quality streak free glass cleaner.